We spend a lot of time walking the floor, and we are very familiar with the ins and outs of convention centers, especially on our home turf in Los Angeles, where we have hundreds of portable trade show display customers that rely on us to lead them in their marketing agendas, providing portable, light weight, budget friendly trade show booth solutions in 10x10, 10x20 and custom sizes to cure your exhibiting needs! TRADE SHOW DISPLAYS IN LA IS WHAT WE KNOW! LA is our homebase, and there's no exhibition center and trade show floor that we are more familiar with than the Los Angeles Convention Center. When you speak to one of our project managers, we are sure to provide you with a selection of trade show booths and portable trade show backdrops that work hand in hand with the rules and guidelines of the LA convention center to ensure you are off to a good start from day 1. Where is the Los Angeles Convention Center? The Los Angeles Convention center is location at 1201 S Figueroa St, Los Angeles, CA 90015, managed by AEG Life and home to some of the biggest exhibitions like the LA County Fair, including the Magic fashion show, Cannabis exhibitions and more, located in the heart of downtown LA and easily accessible, making it the perfect home for trade show booths of all shapes and sizes as companies showcase their brands! Promoting your trade show booth in Los Angeles! There are tons of ways to promote your booth, often even before showing up to your event! Find product showcases, newsletters, marketing and social events, PR and media tours, and other ways to drive traffic to your trade show booth. 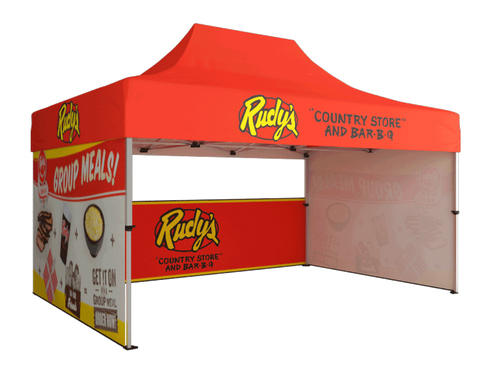 Whether you have a portable trade show display or massive custom structure, it's not the size that matters, it's the presentation and trade show design that ties in your marketing message to your graphic backdrop! Determine your exhibition goals in Los Angeles! Having a trade show display with an agenda is always key, and coming to the exhibition with this goal is what will seperate you from the rest. What key accounts are you targetting? Which product and services are you trying to push? Your trade show backdrop and display needs to broadcast that exact message, so make sure your trade show design has all the elements to help push that message as you put the pieces into play!